An irregular heartbeat is an arrhythmia (or dysrhythmia). The heart is beating too fast, too slow, or irregularly. What is happening is the electrical circuitry of the heart that causes it to beat in an organized and appropriate manner gets short-circuited. Arhythmia causes the heart to be ineffective in pumping blood to the rest of the body. The reduced blood flow to the heart muscle can cause an arrhythmia. Many heart arrhythmia medical malpractice cases are against primary care doctors who miss or ignore the symptoms that are there to be seen. There are also malpractice cases involving the care of patients who have persistent arrhythmia. The standard of care for a primary care physician for a patient with symptomatic and persistent arrhythmia is to ensure that the patient promptly receives further evaluation and treatment, to determine the presence of any underlying heart disease, and to see that any necessary pharmacologic or another cardiologic treatment is started and monitored. The primary care doctor needs to keep in mind the prognosis can include sudden death. With this risk, further evaluation for cardiac disease and clarification of cardiac diagnosis is of primary importance. The primary physician also must rule out non-cardiac disease possibilities, including anemia, electrolyte imbalance, primary thyroid disease, and illicit drug use. Excluding these other conditions is of particular importance if there is no known prior heart disease, and a low likelihood of structural heart disease exists based upon the history, physical examination, and electrocardiogram. Many medical malpractice cases involving heart arrhythmias are against the emergency room doctors and the hospital. When people come to the emergency room with this condition, cardiologic consultation should be obtained without delay to obtain needed further workup. 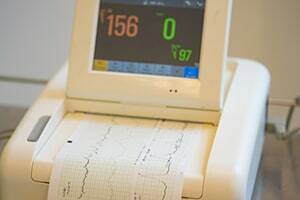 Often this requires medicine, including beta blockers, and review of the need for electrophysiologic evaluation and treatment, and other tests to exclude the presence of a non-cardiac cause for the arrhythmia. Below are sample verdicts and settlements in heart arrhythmia cases. Make no mistake: these are plaintiffs' verdicts only. We walked past a lot of defense verdicts in compiling these. These are hard cases to win. If the facts or the victim's lawyers are not great, the likelihood of success is low. You can also find a sample heart arrhythmia lawsuit filed in Maryland here. 2015 California, $5.6 Million Verdict: A 25-year-old schizophrenic was in a drug study and died. His family filed a lawsuit that the doctor who conducts the study ignored his initial screening EKG reports demonstrated he had current cardiac arrhythmia and prior cardiac disease. 2014 Pennsylvania, $1.1 Million Settlement: A 38-year-old female underwent minor surgery. The anesthesiologist did not maintain the decedent's oxygen level during after surgery and she died of a heart arrhythmia. 2011, California, $1.7 Million Settlement: A 48-year-old man, who, like many of us, hated going to the doctor had hypertension. While walking with his wife on the beach, he suffered a syncopal episode, losing consciousness. He went to his family doctor who did not test for the syncopal episodes. He died four days later of heart arrhythmia. His family alleged in a medical malpractice suit that his PCP should have referred him to a cardiologist for more testing. If this had been done, the family claimed, an echocardiogram and telemetry monitoring. 2010 Florida, $6.5 Million Verdict: A 41-year-old college professor had difficulty breathing five days after gastric bypass surgery. He was positioned in such a way, his family alleged, that exacerbated his breathing problem and caused a fatal cardiac arrhythmia. Specifically, the allegation was that placing him flat on his back, aggravated the already low oxygen levels and caused a lack of oxygen causing a fatal cardiac arrhythmia. If you have suffered from medical malpractice from a misdiagnosis, we can help you learn about your options and determine whether there is a path forward to get compensation for the harm that has been done. Call us today at 800-553-8082 to discuss strategies to get you compensation for your loss. There is NO COST OR FEE of any kind for this case evaluation. You can also get a free online case review.